We expect a wafer shortage in 2021, and sales signal server DRAM price recovery in 3Q. Ibiden’s 50% capacity boost at Ogaki is for Intel’s EMIB substrates and FC-BGA for server CPU. 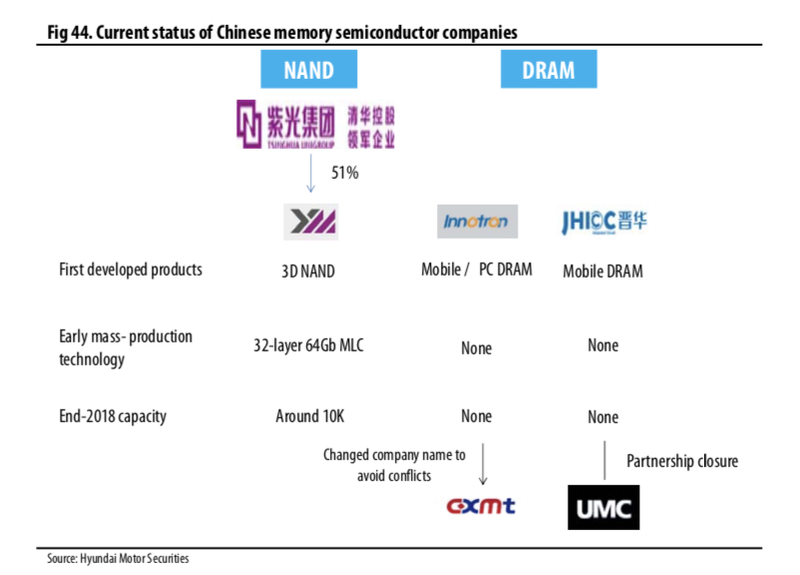 Samsung is our favorite, followed by Hynix, Innotek, SEMCO, and LGE. We visited the major IT H/W (hardware) companies in Japan and Taiwan from March 18 to 23 and checked the current concerns of the IT H/W industry. What we learned from our visit is as follows: 1) Server and PC DRAM prices are forecast to drop 30% QoQ in 1Q19, 20% in 2Q, and 10% in 3Q. However, 5G and AI should continue to fuel demand, so much so that wafer supply is likely to be in shortage again in 2021. Even in a skeptical scenario, DRAM prices are expected to rebound starting in 2H20, also, Aspeed’s sales, a leading indicator of server demand, is projected to grow 18.6% QoQ in 1Q19, signaling that server DRAM sales could grow in double digits QoQ in 3Q19; 2) the new Apple (NASDAQ:AAPL) iPhone’s production volume fell 70% QoQ to 17.3mn units in 1Q19, but we expect volume to increase 37% QoQ in 2Q after price cuts. Shipments of the P and Mate series by Huawei in 2018 are close to the combined shipments of Samsung Electronics’ (OTC:SSNLF) flagship models; excluding the North American market, Huawei’s market share was already close to Samsung’s in 2018, and it may overtake the Korean tech giant in 2019; 3) commodity multi-level ceramic capacitor (MLCC) prices are expected to decline by 28% QoQ in 1Q19 and 13% QoQ in 2Q19 before gaining a firmer footing in 2H19. Ibiden, the world's No. 1 semiconductor PCB maker, is aiming for a 50% increase in capacity. It is partly for Intel's (NASDAQ:INTC) server CPU, but more than 70% of the newly added capacity will be for EMIB (embedded multi-die interconnect bridge) substrates which connect various chips (CPU, GPU, HBM) with the package. Aggressive capacity expansion reflects an optimistic view toward AI server and GPU demand. For 2H19, we like Samsung the most in the Korean IT H/W sector for its strong earnings momentum in 2H. After Samsung, we favor Hynix, Innotek, SEMCO, and LGE, in order of preference. Leading indicator signals server DRAM demand rebound in 3Q, but how strong? We visited major IT H/W companies and research institutions such as DRAMeXchange, Stone Partners and InnoResearch in Japan and Taiwan from March 18 to 22 to examine current issues such as: 1) The memory contract price outlook; 2) New iPhone shipments, Samsung and Huawei’s smartphones; and 3) The supply-demand balance of MLCCs and silicon wafers. To make a long story short, we believe memory chipmakers’ earnings will be sluggish in 1H19 as server and PC DRAM prices are projected to drop 30% QoQ in 1Q, 20% in 2Q, and 10% in 3Q. However, 5G and AI should continue to fuel demand, so much so that wafer supply is likely to be in shortage again in 2021. Even in a skeptical scenario, DRAM prices are expected to rebound starting in 2H20. At minimum, a bargain-hunting strategy in the mid to long term still looks valid. Additionally, Aspeed’s 1Q19 sales are expected to grow 19% QoQ. This is important because Aspeed is a leading maker of baseboard management controllers, a major leading indicator of server DRAM demand. Aspeed’s 1Q19 sales, which account for 70% of global server BMC demand and lead server DRAM demand by six months, signal that server DRAM sales could grow in double digits QoQ in 3Q19. Furthermore, Intel’s new server CPU Cascade is scheduled for launch in 2Q19, and most tech companies (except Facebook (FB)) are likely to resume building hyperscale data centers equipped with newer CPUs. Better, in addition to mainstay public cloud companies, new players like TikTok, JD (NASDAQ:JD), and Meituan (OTCPK:MPNGF) have been building their own private data centers since 1Q19. The edge computing investments for the 5G infrastructure are also under way. 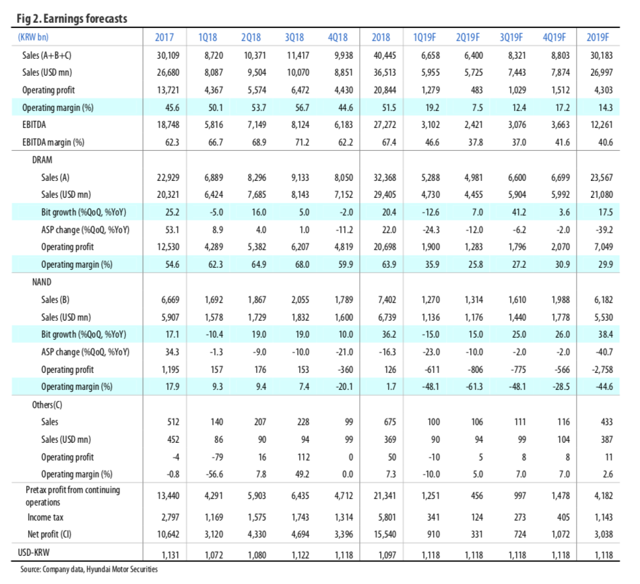 Of course, 1H19 earnings, which fall far below expectations, could be a burden in the near term but we should not overlook clear earnings visibility from 2H19. Meanwhile, the new iPhone’s production volume fell 70% QoQ to 17.3mn units in 1Q19, but we expect the volume to increase 37% QoQ in 2Q after price cuts. Mobile DRAM prices remain higher than expected as Huawei has benefited from sluggish iPhone sales. Of note, Huawei's P and Mate series come with 8GB mobile DRAM, more than twice as much as Apple's. Huawei's smartphone shipments surpassed 200mn units in 2018 and are likely to grow to 280mn units in 2020. The shipments of the P and Mate series in 2018 are close to the shipments of the Galaxy S9 and Note9 combined. Huawei's market share in Western Europe already has surpassed 20%, and except for the North American market, where its sales suffer for political reasons, Huawei's smartphone market share is close to that of Samsung. Against this backdrop, we believe SK Hynix and LG Innotek, which supply key semiconductors and camera modules to Huawei, stand to benefit long term. As for MLCCs, commodity MLCCs prices are expected to decline 27.5% QoQ in 1Q19 and 12.5% QoQ in 2Q. We expect prices to begin stabilizing from 3Q. SEMCO’s blended ASP is expected to increase YoY in 2019 through product mix improvements. 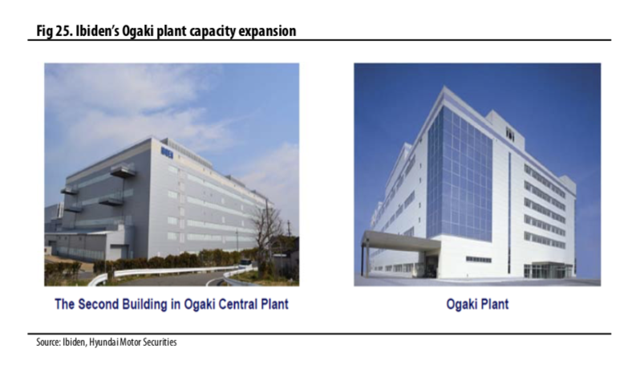 Although Murata's (OTCPK:MRAAY) three new plants, SEMCO’s Tianjin plant, and Taiyo Yuden’s (OTCPK:TYOYY) Niigata plant are scheduled to ramp up in 2Q20, we still believe demand will outrun supply as the newly added capacity will be mostly dedicated to automotive and industrial MLCCs. Major IT H/W companies will probably see earnings deteriorate in 1H19, but momentum from AI and 5G will grow stronger, with price declines further stimulating demand. Of course, the speed of stock rebounds may be faster than the speed of earnings deterioration, but a bargain-hunting strategy is still valid, given the clear visibility and direction of demand. Even with gloom in the 1H19 earnings outlook, we present Samsung and Hynix as our top picks in light of the prospect of a strong recovery in the second half. We like Samsung best followed by Hynix, Innotek, SEMCO, and LGE. When will server DRAM prices rebound? Our meeting with DRAMeXchange confirmed our belief that prices of server and PC DRAM are falling faster than expected and that prices will likely continue to decline through 2H19 before they start to rebound in 3Q20. We need to see how accurate the price forecasts of Taiwanese memory semiconductor research firms will be, but at minimum we cannot ignore their projections because they have been quite accurate from 4Q18 up to now. DRAMeXchange believes that demand for server DRAM for data centers will not be as strong as in 2018 due to contracting demand from public cloud companies despite: 1) Intel’s launch of new CPUs; 2) 5G-driven edge computing demand; and 3) demand to build data centers from second-tier Chinese companies (TikTok, JD, Meituan). The Cascade CPU is to be released in 2Q19 in all certainty, but several cloud companies may take a rain check on Cascade to opt for the following model, although Cascade is supposed to improve CPU performance by 20% compared with the current Skylake CPU. Indeed, Facebook plans to skip the Cascade CPU to opt for the 10nm Ice Lake processor to be released in 2021. Amazon (AMZN) and Google (NASDAQ:GOOG) (NASDAQ:GOOGL), on the other hand, plan to use Cascade for their new data centers to cope with increasing data center traffic. Recently, the market has witnessed server DRAM demand rising from some public cloud operators, and we find it positive that second-tier Chinese companies are driving server DRAM demand. However, server DRAM inventory still remains high, and it looks like it will take several months at least before the inventory is depleted. Against this backdrop, server and PC DRAM prices are projected to fall 30% QoQ in 1Q19, 20% in 2Q, 10% in 3Q and 5% in 4Q. For the whole year, we forecast a 45-50% drop YoY. 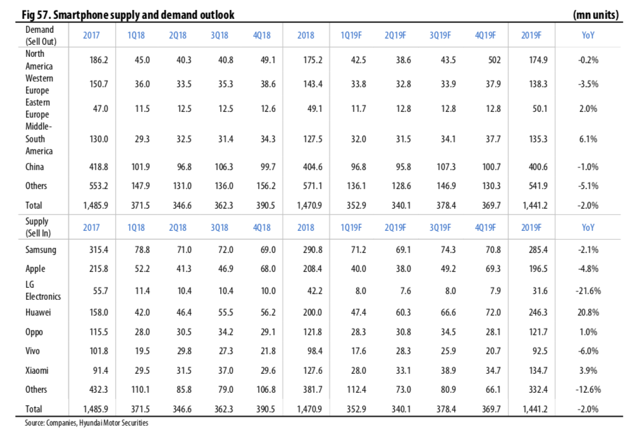 The steep price drops are expected to stimulate demand from 3Q19, and DRAM demand bit growth for 2019 should reach 19.7% as a result. With DRAM prices falling faster than what the market expects, growth in demand should be higher than the market consensus of 15%. Since Micron (MU) recently cut production by 5% (which has the effect of reducing total supply by 1%), DRAM supply will be mainly led by Samsung and Hynix. Since Samsung and Hynix have not revealed any plans to cut production yet, we need to monitor wafer input by Korean players amid sharp price declines. On the other hand, mobile DRAM prices are sliding at a relatively milder pace. Huawei's market share is rising rapidly as Apple's new iPhone sales are sluggish amid the US-China trade dispute. While Apple's iPhone comes with 3GB/4GB DRAM, Huawei smartphones are equipped with 8GB DRAM. As Huawei capitalizes on sliding iPhone shipments, companies like Hynix are benefiting from this. Meanwhile, Samsung is strengthening its marketing of the Galaxy S10. Since the Galaxy S10/S10+ comes with 8GB/12GB DRAM, mobile DRAM demand is likely to remain relatively strong in 1H19. In 1Q19, LP DDR4x price is forecast to fall 10-15% QoQ in 1Q19 and 5-10% in 2Q and 3Q. As for graphic DRAM, we expect demand to increase (especially for GDDR5 products) with the launch of Sony’s (SNE) PlayStation 5 in 4Q19. In addition, consumer DRAM prices are sliding at a milder pace of low-single digits, according to the Taiwanese consumer DRAM maker Winbond. Nanya Tech, a consumer DRAM maker with a product portfolio comprised largely of PC DRAM, was able to contain ASP decline to 10% QoQ in 4Q18. In conclusion, the DRAM industry at present is characterized by sharply falling PC DRAM prices (caused by the tight supply of Intel’s PC CPU) and server DRAM prices (caused by public cloud operators’ inventory adjustments). However, the supply-demand balance of mobile and consumer DRAM is still healthy. Ibiden’s (OTCPK:IBIDF) capex and Aspeed’s sales: What are they saying? In the end, the biggest swing factor of DRAM supply-demand dynamics going forward is server DRAM demand. There are many ways to monitor server DRAM demand, but we first need to look at leading indicators rather than the server DRAM inventories of server companies and DRAM makers. We should first note that Intel is not considering increasing CPU capacity and that it is reducing the portion of PC CPU by boosting the production of server CPU which has a higher price premium. The only way to increase PC CPU supply in the future is to improve the yield of 14nm CPU. This is because, although lowering server demand has loosened server CPU supply, PC CPU supply could tighten again with the launch of the Cascade Lake CPU in 2Q. Then, what would be the leading indicator of Intel's server CPU shipments? We believe the shipments of FC-BGA for Intel’s server CPU could be a leading indicator. Ibiden and Shinko are supplying FC-BGA for Intel’s server CPU - AT&S and Unimicron have also begun to supply since 2018. However, since there are a number of FC-BGA suppliers for servers, it's difficult to calculate the exact number. Recently, Ibiden announced a plan to expand the capacity at its Ogaki plant in Japan by 50%. 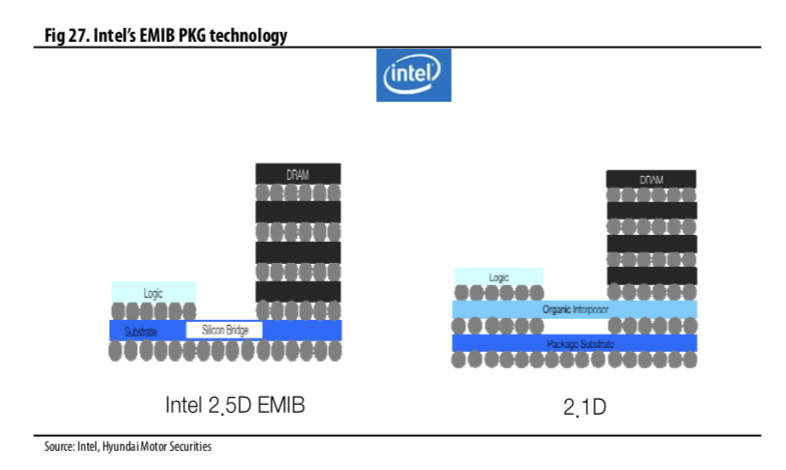 Some believed the move was to invest in PKG substrates in relation to Intel's EMIB (embedded multi-die interconnect bridge). More recently, however, the more popular view is that 70% of total capex is for EMIB PKG and 30% is dedicated to FC-BGA for server CPU. EMIB is a technology that connects various chips such as CPU, GPU, and HBM (High Bandwidth Memory) with PKG, and it's expected to be more widely used in supercomputers and game consoles. 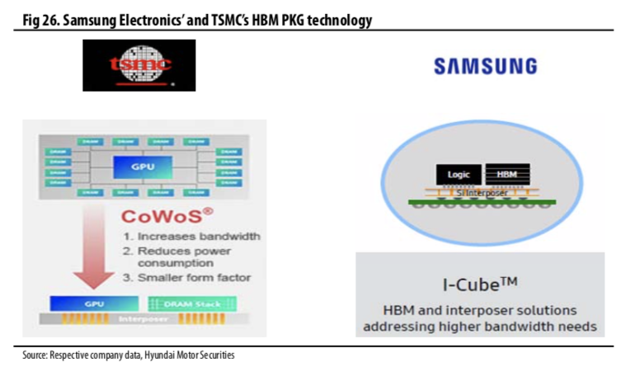 Samsung, TSMC (TSM), and UMC (UMC) are picking up R&D efforts to make 2.5D PKG which can realize a wider bandwidth and lower power consumption. Although Ibiden's capacity expansion at the Ogaki plant is not solely for data centers, it's partly for FC-BGA (to capitalize on server CPU demand) and EMIB PKG (targeting the expansion of the AI ecosystem), which we find positive. We need to pay attention to Taiwan’s Aspeed as it can be a barometer of data center server investment. Aspeed makes baseboard management controller chips for server boards and currently has a 70% market share, supplying the likes of Cisco (CSCO), Dell (DELL) and Lenovo (OTCPK:LNVGY). BMC is a solution that reduces errors and maintenance costs by remotely controlling servers. After acquiring Broadcom's (AVGO) BMC unit in 2016, Aspeed’s market share expanded to more than 70%. As of now, HP is producing BMC chips in house and Dell is using Nuvoton's BMC chips, but most other server companies are using Aspeed’s BMC chips. In particular, cloud companies that are using servers from Taiwanese ODMS, such as Amazon and Google, are using Aspeed’s products. As such, Aspeed’s order volume could be a leading indicator of server DRAM demand for data centers. Aspeed’s year-to-date sales as of February grew 9.4% YoY and are likely to grow over 10% YoY for the full year. 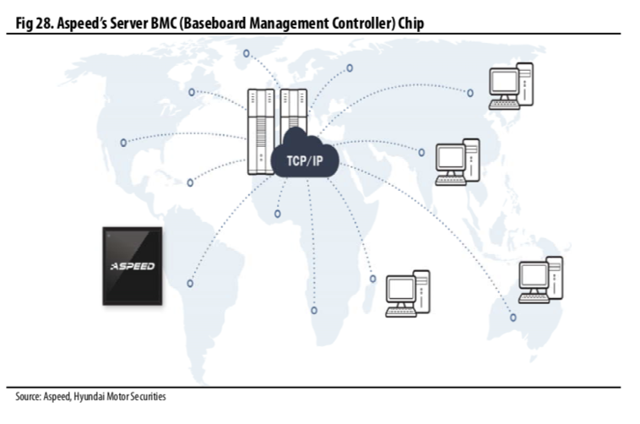 BMC chips account for 92% of Aspeed’s total sales. Its quarterly sales are recovering after bottoming out in 4Q18. 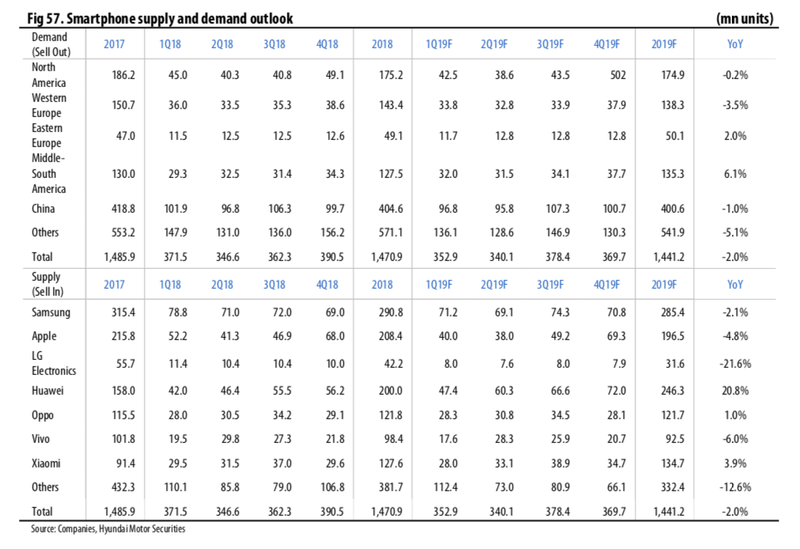 Since its sales lead server DRAM demand by six months, its 1Q19 sales growth of over 6% YoY means that data center investments could grow over 6% YoY in 3Q19. It is most likely that server DRAM sales will increase in 2H19. However, it is premature to discuss the possibility of a V-shaped recovery. Meanwhile, the Feb. YTD sales of Quanta, which have a high portion of Server ODM, were flat YoY, while Wistron, which has a relatively low server ODM portion, saw its YTD sales in Feb. slide 10% YoY. China’s tier-2 group is building new data centers: Who are they? Although server suppliers are suffering from a decline of data center investments by public cloud companies, tier-2 companies, especially those in China, are generating fresh demand as they move to build their own server farms. Even when DRAM prices are likely to go down further, tier-2 companies’ demand does not falter. Most notably TikTok, a short mobile video platform, is building its own data centers. JD (Jing Dong) which was acquired by Tencent (OTCPK:TCEHY) also is actively moving to build its own data centers to compete against Alibaba (BABA). Meituan is another one, as the company is trying to strengthen its O2O service platform. Additionally, Foxconn (OTC:FXCOF), which is busy building the smart factory infrastructure, announced a plan to set up data centers in Taiwan’s Kaohsiung, in addition to China. Unlike public cloud operators that buy server DRAM on a large scale, those tier-2 companies focus less on price and more on securing volume. Meanwhile, telcos in China, the US, Korea, and Japan are expected to expand the edge computing ecosystem by building micro data centers in cell towers. Of course, the investments made by tier-2 companies and telcos are not big enough to offset dwindling demand from public cloud operators. However, they are enough to provide an additional catalyst for server DRAM demand when public cloud companies begin their investments in earnest. Amid NAND oversupply, Micron also announced a 5% production cut following Toshiba/WD (OTCPK:TOSYY). The companies’ production cuts represent 5.6% of global supply, and NAND prices are expected to continue to decline. For Toshiba, the new fab 2 as well as fabs 3, 4, and 5 are likely to cut production whereas the new fab 6’s operation will begin in 1Q19 with a capacity of 20,000 wafers/month. At Toshiba/WD, 3D NAND's share of production is expected to increase to 75% this year from 55% seen at the end of 2018. 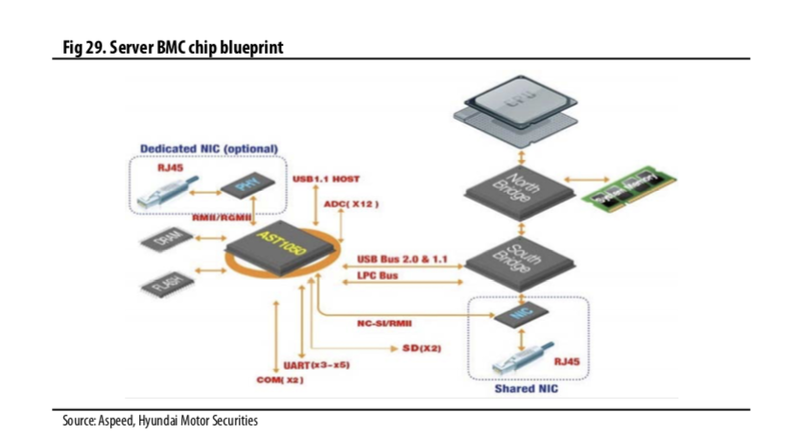 Meanwhile, Micron’s 2D NAND flash should phase out and its fab 10 (Alpha) will likely ramp up from 3Q19. 3D NAND represented 75% of production at the end of 2018 and is expected to grow to 95% by end-2019. As the industry in general is increasingly focusing on 3D NAND and TLC/QLC, NAND price declines led by SSD will likely continue. Due to sluggish demand and a rising portion of 3D NAND, the average NAND price is expected to plunge 41.5% this year vs. 23.5% in 2018. As a result, the global NAND market should contract 20.8% YoY in 2019, in contrast to 2018 when it expanded 10.9% YoY. Amid the NAND price falls, SSD’s notebook penetration rate is likely to rise from 54% in 2018 to 61% in 2019; SSD’s desktop penetration rate is also expected to rise to 26%. In the enterprise SSD market, Samsung and Intel continue to cement their oligopolistic positions. Supplying both SSD and DIMM, Samsung is the strongest player in terms of product performance. We believe Samsung’s enterprise SSD market share slipped to 38% YoY in 2018, but its hyperscale products still boast an extremely high market share. As for Intel, its presence in the enterprise SSD market is gradually strengthening thanks to its dominant market share in server CPUs. We estimate Intel’s market share in 2018 was around 25%. Meanwhile, China's YMTC is trying to mass produce their products, unlike other Chinese DRAM makers. YMTC is mainly developing 32-layer MLC and 64-layer TLC products. Its wafer input volume as of the end 2018 was 10K and is likely to increase to 30K by end-2019. As for Fujian Jin Hua, UMC has dissolved its product development team amid the US-China trade dispute, and no products have reached a mass-production stage yet. There are rumors that Fujian Jin Hua will transform its DRAM line into a foundry line, but the entry barrier to the foundry market itself is very high. In the meantime, Innotron changed its name to ChangXin Memory Technologies (CXMT) as its key engineers are from Taiwan’s Inotera (currently Micron Taiwan), which leaves room for misinterpretation. Our visit confirmed that the ongoing feud between the US and China has depressed China’s drive to develop semiconductor independence. It is clear that the trade war provides a long-term opportunity for Korean chipmakers. Meanwhile, there are growing rumors that China’s central and local governments will instead opt to invest in OLED as its semiconductor ambitions are discouraged by the trade dispute. We found that the new iPhone’s production volume plummeted more than 69% QoQ in 1Q19 after our visits to Japanese and Taiwanese companies. According to Taiwanese EMS companies, the volume likely fell 69.4% QoQ to 17.3mn units and by Japanese parts suppliers, the volume plunged 69% QoQ to 16.5mn units. Due to the long period of sluggish sales, Apple is now offering the new iPhone at an increasing discount, especially in China. As a result, we expect the production volume to increase by over 37% QoQ to 24mn units in 2Q. Since the launch in 3Q18, about 118mn units of the new iPhone will have been assembled by the end of 2Q19, with 59.5mn units being offered in OLED and 58.1mn units in LCD. The problem is that now that the smartphone market has fully matured, Apple has no choice but to reduce its prices. That the boycott against Apple is spreading around China does not help either. Meanwhile, we do not expect to see any significant innovative changes in H/W when Apple rolls out a new smartphone in 2H19. Like last year, Apple will likely launch two OLED models and one LCD model. OLED models are expected to come with triple cameras, and LCD models will be upgraded to a dual-camera module. Since Samsung and Chinese makers already have triple-camera smartphones, it would be difficult for Apple to differentiate its products against competitors. In particular, since the Galaxy S10+ offers 1TB UFS, it was thought that the new premium iPhone also would come with 1TB UFS, but after visiting Taiwan we found that it was not so. Apple appears to have recognized the difficulty of raising prices through parts price hikes, when the smartphone market is anticipated to contract. Meanwhile, Japan-based Sharp (OTCPK:SHCAY) saw its sales fall in 4Q18 (3Q18 for Sharp) despite an increase in the number of dual cameras installed on the back of the iPhone. The biggest reason is the transfer of the 3D sensing module to Foxconn. Apple is likely to support a rear TOF (time of flight) camera and Y-Octa technology with its 2020 new models. Samsung's Galaxy S10 shipments are better than expected. Samsung is trying to further strengthen its market presence by spending massively on marketing. Given the new iPhone’s struggle in the market, Samsung’s decision to expand marketing seems like a productive move. However, profitability is unlikely to improve on a meaningful scale given the substantial marketing costs. After checking with Samsung’s major suppliers, we estimate the Galaxy S10’s production volume will rise more than 20% vs. its predecessor, exceeding 25mn units. Because production in 1Q will be higher than 2Q’s, suppliers’ sales are expected to decline QoQ in 2Q. The Galaxy S10+’s production volume is only slightly higher than that of the S10, but demand for the S10+ has surpassed expectations - thus, Samsung is likely to increase production of the S10+ from April. Despite the higher-than-expected shipments in 1H, we keep our annual shipment forecast of the Galaxy S10 unchanged at 37mn units. First, Huawei's shipments growth is sharper than expected, and Apple has begun to shore up sales by deciding to cut prices in 2Q. Since the price of the new iPhone in 2H19 is still the subject of much speculation, we need not read too much into the better-than-expected performance of the Galaxy S10 - suffice it to say that sales are increasing when smartphone demand is dwindling. We are especially impressed by Huawei's growing smartphone shipments. In particular, the strong sales of the P series (which is similar to the Galaxy S) as well as the Mate series (similar to Galaxy Note) are remarkable. It's reminiscent of 2012-2013 when Samsung’s Galaxy S and Note series both became massive hits. In 2018, the combined shipments of the Galaxy S and Note were probably similar to the shipments of Huawei's P and Mate series. In 2019, it's even possible that Huawei’s new flagship smartphones may surpass Samsung smartphone shipments. In 2020, Huawei's total smartphone shipment volume is expected to surpass 280mn units, threatening Samsung in total volume. Unlike other Chinese smartphone companies, Huawei's market share in advanced markets such as Western Europe is more than 20%. The P and Mate series are high-end smartphones, and users recognize them by performance. For security and political reasons, Huawei's North American market share is less than 1%. Excluding the North American market, Huawei's global market share was close to Samsung’s market share in 4Q18. Since Samsung’s market share in China is less than 1%, it would be unfair to compare these two excluding the North American market. However, we note that Huawei's North American market share was hurt by political reasons whereas Samsung’s Chinese market share is the result of market logic such as price. What's clear is that Huawei's product strength and brand equity have now become a threat and it's no longer a surprise if the Chinese name claims the No. 1 position in the global smartphone market. In the finished product market, the top two companies by sales represent the whole operating profit mostly - as such, despite the strong sales of the Galaxy S10, Samsung's smartphone business is still in crisis. It's time for Samsung to have some kind of shield by achieving H/W innovations such as foldable smartphones and by converging with the new ecosystems such as automotive electronics and robots. Samsung is the world's largest mobile OLED player with a market share of more than 87% supplying such names as Apple, Oppo/Vivo. Oppo and Vivo also are active buyers of SEMCO’s camera modules and MLCCs in addition to Samsung’s display and memory chips. Samsung is trying to sell its Exynos mobile processor which supports 5G models to Oppo/Vivo. Meizu, Samsung has always had difficulties in expanding its AP client base. Oppo and Vivo are the most eager buyers of Samsung’s products and the parts made by Samsung affiliates. They are also major customers of Samsung Display's flexible OLED. Recently Samsung has become the first company to introduce an active-area hole design through the Galaxy S10/S10+ and is believed to be in talks with Oppo/Vivo over the supply of the same display. However, Oppo/Vivo recently released smartphones with bezel-less, no-hole displays. The completely bezel-less display comes with a pop-up camera, since a no-hole display cannot be realized with a selfie camera. Oppo's F11 smartphone supports a pop-up camera in full screen. Vivo’s new smartphone offers a rear screen with a selfie camera function. In all, there's a growing interest in “no-hole” smartphones. It is time to move ahead of others and develop an innovative design. 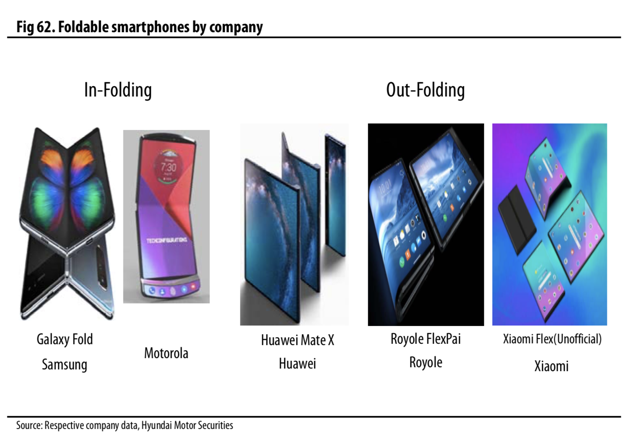 Foldable phones need more time; burn-in issue with out-folding smartphones? As for foldable smartphones, Samsung’s Galaxy Fold is the most advanced technologically. Its hinge, developed by a Korean parts supplier, is able to fold at least 200,000 times. Samsung’s in-folding smartphones follow the hinge mechanism and have a small gap at the hinge end, but it is not serious enough to hamper the user experience. We believe future technological innovations will allow companies to roll out thinner displays and hinges. Samsung Galaxy Fold’s hinge is the culmination of metalwork efforts, including metal injection molding (MIM), die-casting, and press. As such, the technology has a high entry barrier. The out-folding smartphones released by Chinese players have simpler hinge mechanisms, and while they are thinner than in-folding smartphones, they are more vulnerable to external shock and less durable because the displays are outwardly exposed. Furthermore, a burn-in problem may occur with out-folding smartphones as one display is constantly on when folded. If used for a long time, two display screens may have different colors when unfolded, a problem that has to be tackled technologically. The in-folding technology is significant because it will make display size expansion easier by allowing smartphones to fold more than twice. Meanwhile, Samsung has only unveiled in-folding smartphones, but some of its new models in 2020 may be out-folding smartphones. Samsung targets to sell 1mn units of the Galaxy Fold this year whereas Huawei targets 500K in sales volume. It's uncertain when Apple will release foldable smartphones. At present, the cover window of in-folding and out-folding smartphones is made of colorless polyimide film. Going forward, out-folding smartphones may adopt ultra-thin glass (UTG), which is believed to be developed by Schott and Corning (GLW). UTG has greater hardness vs. CPI so it is more scratch resistant but the prevalent view is that it is not suitable for in-folding smartphones because it does not curve well. We found that commodity MLCC prices had been plummeting after visiting Taiwan’s Yageo and Japanese MLCC companies. Taiwanese companies with more than 55% sales exposure to China are especially hit hard by faltering Chinese demand. With Walsin proactively pushing for price cuts to achieve a bigger market share, MLCC prices likely fell 28% QoQ in 1Q and will probably fall further in 2Q, by 10%-15%. However, commodity MLCC prices have increased fourfold from the bottom seen in 2018. Thus, even if they fall by more than 50%, they would still be twice as high as they were at the bottom. Taiwanese MLCC makers will still be able to enjoy margins at the 20% level even after a margin squeeze. Taiwanese names gain most of their sales from PCs, TV sets, and low/medium- priced smartphones; their auto electronics sales are confined to the infotainment segment. Murata focuses on auto electronics and industrials by reducing the size of high-capacitance MLCCs. SEMCO is beefing up the capacity of its Tianjin plant and strengthening marketing in order to become a more competitive player. Yageo also is building a new plant in Kaohsiung, Taiwan, which will not come on stream until 2021. Overall capacity is expected to grow from 2Q20 as Murata’s three plants (two in Japan and one in China), Samsung’s Tianjin plant, and Taiyo Yuden’s Niigata plant come online. However, the new capacity is mostly for auto electronics and industrials, and given the ramp-up period, it is unlikely to lead to oversupply. The Korean IT H/W sector, which recorded an earnings shock in 4Q18, is expected to report another earnings shock in 1Q19 due to plunging memory prices, anemic display demand, and contracting demand in China. However, shares have rebounded on expectations for the resolution of the US-China trade dispute. Micron’s decision to cut production also is expected to benefit leading DRAM makers such as Samsung and Hynix. However, we still advise investors to “buy low” rather than chasing the stocks higher. As confirmed by our visit to SUMCO (OTCPK:SUOPY), the 5G and AI revolutions are expected to spur demand in the next two years so strongly that wafer supply may be in shortage again in 2021. Furthermore, given the steep declines in server and PC DRAM as well as NAND flash chips, we expect memory chip prices to rebound in 2H20. It's clear where the industry is headed in the mid to long term. It's also clear that memory semiconductors and passive components are the biggest beneficiary of the unmanned system revolution amid the rise of AI and 5G. However, we advise investors to look for bargain-hunting opportunities since the pace of decline in demand and price is sharper than expected. For LGE, although seasonality is favorable in 1Q, we would consider pocketing profit since earnings momentum is expected to cool from 2Q. As for LG Innotek, we believe earnings bottomed out in 1Q as Apple's production volume is anticipated to increase in 2Q. We present Samsung and Hynix as our top pick as they are set to benefit long term from the rise of 5G and AI. 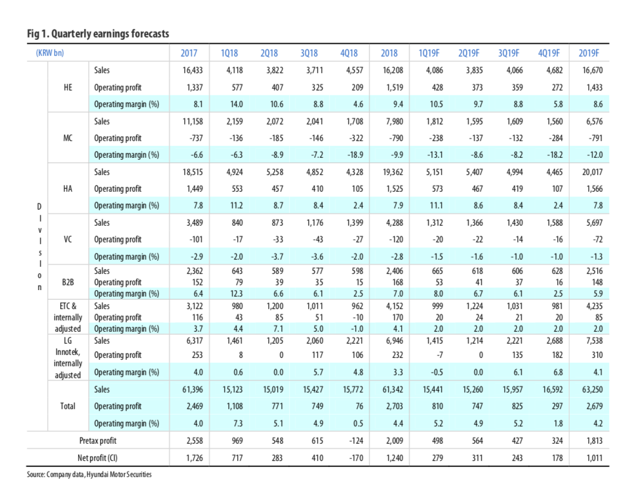 Although their earnings are likely to deteriorate until 2Q, it is highly likely that earnings will pick up from 3Q, and we believe earnings growth is sustainable until 2021. We like Samsung best, followed by Hynix, Innotek, SEMCO, and LGE. We maintain buy and our six-month-forward target price of KRW52,000 (1.4x 2019F BPS) on Samsung Electronics. We believe Samsung raked in KRW55.2tn in revenue in 1Q on the back of higher-than-expected Galaxy S10 sales but operating profit likely missed our previous estimate by 25% at KRW6.8tn on sharp server DRAM price declines and Samsung Display’s margin squeeze. In 1Q especially, Galaxy S10’s sell-in volume reached almost 13mn to boost captive demand, which likely resulted in stronger DRAM bit growth vs. competitors. Semiconductor operating profit likely fell 41% to KRW4.6tn in 1Q, and the display division probably turned to loss of KRW760bn. On the other hand, IM operating profit is estimated to have expanded to KRW2.8tn on Galaxy S10’s massive sell-in volume and its operating margin likely widened QoQ considerably as a result. We find it especially positive that the Galaxy S10+ comes with 12GB mobile DRAM. That said, we expect earnings to continue to decline in 2Q because: 1) DRAM prices could continue to fall; 2) Samsung Display is expected to remain in loss; and 3) the IM division’s marketing costs will likely escalate. Although the Galaxy S10 sales are stronger than expected and Galaxy Fold has shown the possibility of further innovations, the biggest swing factor of earnings, first and foremost, is memory semiconductor. Taiwan-based Aspeed’s 1Q19 sales, a leading indicator of server DRAM demand, are expected to grow 19% QoQ and Intel is confirmed to release its Cascade CPU in 2Q19. As such, earnings are most likely to improve QoQ in 3Q. From 2020, the convergence between 5G and AI is likely to fuel demand, which could lead to marked earnings growth for Samsung. We are also encouraged by the possibility of the company gaining more clients with its 5G baseband chips. 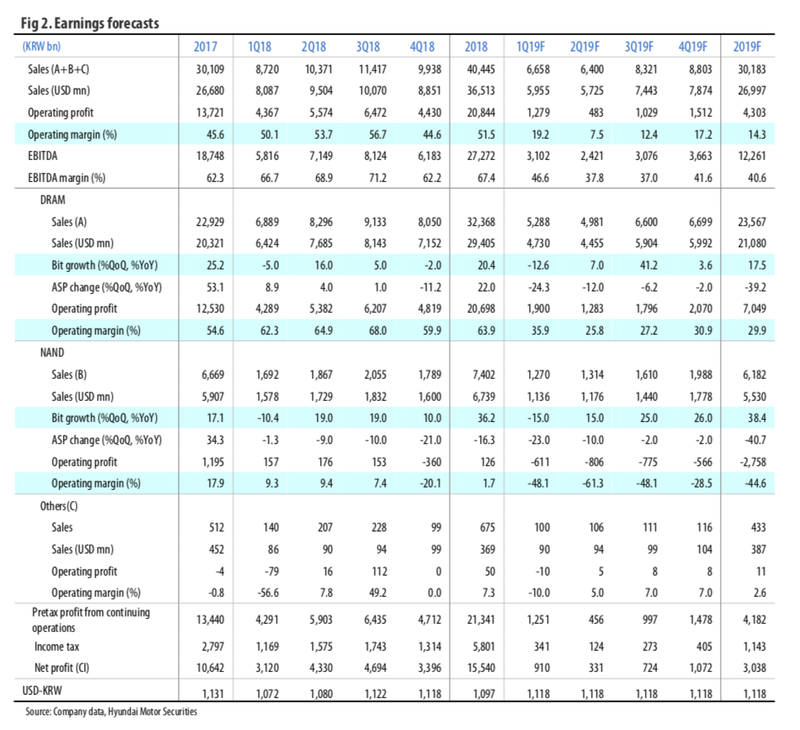 The earnings outlook is slow until 2Q19 but a bargain-hunting strategy in light of DRAM demand recovery in 3Q is valid. We maintain buy and our six-month-forward target price of KRW92,000 (1.35x 2019F BPS) on SK Hynix. Due to the steeper-than-expected decline of server DRAM prices, we expect Hynix’s 1Q19 revenue and operating profit to miss our estimates by 9% and 54% to come in at KRW6.6tn and KRW1.3tn, respectively. Since Hynix has bigger exposure to server DRAM vs. peers, its DRAM ASP is expected to fall sharply. NAND ASP also is expected to slide 23% QoQ as the prices of client SSD and UFS sharply fell. However, Hynix’s mobile DRAM shipments are better than expected as Huawei is benefiting from the slow sales of the iPhone. Huawei prefers Hynix’s products to competitors, and its P and Mate series are equipped with 8GB DRAM, doubly higher than the DRAM used by Apple, which bodes well for Hynix. With server and PC DRAM prices forecast to drop 20% QoQ in 2Q19, we estimate Hynix’s 2Q revenue and operating profit will retreat 3.9% and 62% QoQ to KRW6.4tn and KRW483.1bn, respectively. Intel’s Cascade CPU is set to go on sale in 2Q, and Amazon and Google are likely to begin setting up data centers with new server CPU from 3Q. Indeed, Aspeed’s sales, a major leading indicator of server DRAM demand, increased 19% QoQ in 1Q. Furthermore, China’s TikTok, JD, and Meituan are building their own data centers while Chinese telcos move to establish micro data centers for edge computing. Since Intel’s improving yield on the 14nm process is expected to help ease the shortage of PC CPU supply from end-3Q, Hynix’s earnings visibility in 2H19 is high, in our view. We recommend bargain hunting the stock to take advantage of the likely recovery of server DRAM demand in 3Q19. We revise down our six-month-forward target price from KRW105,000 (1.2x 2019F BPS) to KRW97,000 (1.1x 2019F BPS) and keep our rating at BUY. Our forecasts of 1Q19 consolidated revenue and OP remain unchanged at KRW15.4tn and KRW809.8bn. HE margin is likely to remain in double digits although it is bound to narrow YoY. TV shipment volume is estimated at 69.3mn units, including 430K OLED TVs. Despite Samsung Electronics’ aggressive marketing push for its QLED TV, consumer preference towards LG OLED and UHD TVs is still high. The H&A division continues to do really well amid 1Q’s strong seasonality, and the domestic sales of healthcare solutions directly benefit from the increasing fine dust level in the air. In particular, the number of air purifiers per home has grown to two to three from just one, and dryer ASP has further increased on ballooning demand for 16kg dryers. Furthermore, LG Styler is becoming a home staple rather than a fancy home clothing system used by few. LG’s presence in the market for dryers, water purifiers, air purifiers, and massagers continues to grow through rentals, which should work to bolster its margins. LG also is increasing the exports of its healthcare solutions to a dozen countries. Meanwhile, Samsung and Chinese smartphone makers have rolled out in-folding and out-folding smartphones but LG launched the V50 ThinQ 5G with an attachable dual screen accessory. LG is strengthening its CLOi AI robot lineup with the arrival of 5G, shifting its focus from airport robots and cleaning robots. CLOi robots have diversified further, from a guide bot to cart bot, porter bot, lawn bot, and clean bot. We believe LG robots will penetrate further into a wide variety of B2B and B2C businesses as the 5G services become the norm. The VC division’s major products such as motors, batteries, and inverters will help the company to become a more competitive player by facilitating meaningful collaborations with subsidiaries like LG Innotek, LG Display, and Robostar. Robots and the VC business provide a new growth engine for the company in the long term; but in the short term, H&A’s share of earnings is still significant. As such, we believe a “sell high” strategy is valid in 2Q in light of strong seasonality.